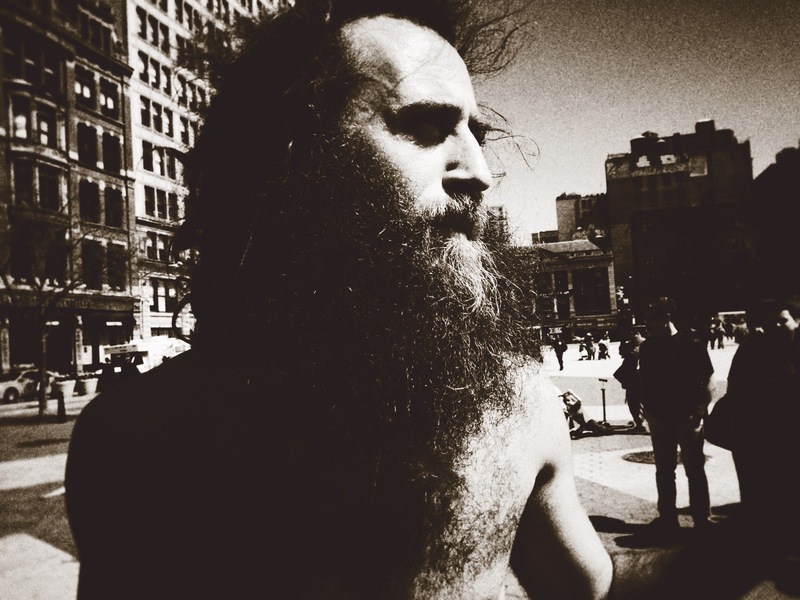 Street portrait, Matthew Silver. Union Square, NYC. What a time warp for you Fernan and pleased to get a look at the younger you. Time is such a dab hand at playing so many tricks on us all . . . I took the photo not so long ago, it was the first time seeing Matthew Silver out in the fresh air and sunshine after the long winter. A wise man. Karl Marx would see himself in that photo. Gerard, if you only knew the thrill it would be to see Karl Marx frolicking with such freedom in Union Square. History might read a little differently! Wow, such a powerful, dynamic portrait, Patti. Almost a timeless quality to it. That’s Matthew for you, thank you Lignum! Cool portrait. I like the contrast and grain. The angle and close up is great too. You never know Cardinal, he might turn up in your part of the world one day! Just fantastic, Patti. I can’t tell you how much I love this photo! Timeless, so strong. That’s Mr Silver for you, thank you Bente! Most grateful, thank you Keith! Thank you Teresa, have just posted a youtube link for further possible enjoyment! Absolutely fantastic photo, Patti. The angle and perspective are remarkable. It was such a pleasure taking this photo, thank you Angeline for your kind words! I don’t know who this Matthew is, but that’s one hell of a photo. Good work, Patti. Thank you Malin, he is so much fun! Fantastic, iconic portrait, Patti! What a shot! He’s almost on the move so good to get a “still” relatively speaking. Thank you Richard for your kind words, he might yet turn up in London one day! Fabulous portrait Patti! Makes me want to know more about Mathew. Careful what you ask for Madhu . . . .
A most impressive duotone treatment on this portrait, Patti. You’ve outdone yourself again! Wow that’s so kind of you to say, big thank you Allan! It’s a mighty fine line getting close here without becoming a tongue-tied part of his act, actually that’s the terrifying part. ..sorry, Patti, but I’m lost ..but I very much like your intensive photo. It’s electrifying. I really do like it. That’s absolutely fine, thank you so much Markus. Easier to leave explanations out of it and let the photo do the talking! …uuuhh, know I get the title of your post… …got it. Cool! Wow, a compellingly striking portrait! A really unique and timeless looking image! And so good to see you here, thank you Andrew. Matthew is an absolute one-off! That’s so kind of you Joshi, thank you! It is a beautiful portrait Patti. It looks unusually still for such a character. One of his more contemplative moments . . . . thank you Philippa! Patti, this is such a great portrait. After doing a little research, and seeing other images, I think yours is one of the best! Do you know if Matthew has seen this? Thank you so much Laurie! I have so many photos of Matthew and yes, he has seen (and liked) the original version which I posted to Instagram but not this one which I played around on my phone with CameraBag. I’m not the biggest user of Instagram but certain friends and family only go there. He’s definitely worth checking out if you ever come to NYC but then again he’s so random with where and when he turns up! Oh thank you for offering more details! He does look like a shepard! Fabulous portrait, Patti! Wow! Love this shot for its rawness and terrific tone. It hits you right in the face somewhat like the images of Don Mcullin from the 70″s. Hope you have a great weekend Patti. So cool. Love the treatment you out on this one. Oh, and, I love your new Patti icon.